We are not a religious bunch of people. We are barely even spiritual. I’d characterize us each as people who are interested in simply being good, maybe even beyond reproach. 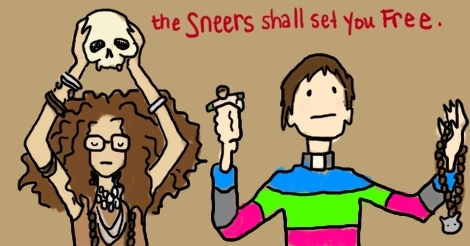 Maybe some of the Junior Sneerists just bump along, existing until inevitably dying and turning to dust. That is to say, this was all the case until we discovered some rubble that was once a temple. Within that rubble were complete sketches of how the temple once looked, and mostly-indecipherable texts describing the rituals and beliefs of the worshipers who once populated this place. We have obviously been drawing inspiration from our new way of life, slipping it in here and there. 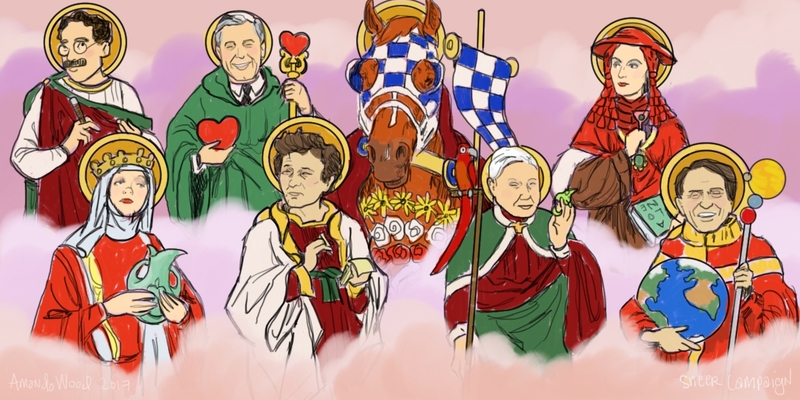 But today, we mostly just wanted to show you this glorious rendition of the eight main saints. There are only eight today, but we will probably unearth some more as our studies deepen. Probably these will eventually be offered to you as eight delightful coloring pages that look like stained glass windows, but hold on a minute, I have only so much time and energy, and also am drowning under a list of things I already have to do. Our saints are all the best people who represent their chosen field as the gold standard. They are pure in heart and deed, no matter what other bad things they have done. Their lives were solidly dedicated to what they became known for. Inspirational. Mr. Rogers is the kindest and gentlest man who ever lived. Secretariat is the most able athlete, who ran for the love of winning and not for the love of advertising deals or money. Greta Garbo is the perfect vision of reticence and aloofness. Bette Davis is the strongest woman who eventually aged into the best version of an old brassy woman. Carl Sagan is the best astrophysicist who ever was, sorry the rest of you hopefuls, and he could explain the universe in ways that even the lowest could understand. Sir David Attenborough has seen the most and knows all of the animals from A to Z. Columbo is the patron saint of mystery-solving and holding the wealthy elite accountable for any homicides they may commit. Groucho is nothing but pure comedy, quips, and one-liners. All of these things are important to us and so we pray to them each, every day.